Before I dig into this post I thought I’d take a minute to tell you about the man in this picture. The man’s name is Robert Lindsey and he is my father. Some of you might think right off that he is obviously my step-father. But no, he’s my dad. He is as much a part of me as my own biological father, a man who I know very little about. He raised me as his own. His family, which included my aunts (Laura, Carla, Ellis and Debra), my uncles (Randy, Wayne, and Larry), cousins, and my Grandma loved me unconditionally. I never felt any different. They were the folks I knew growing up as my family. I thought about my dad a lot this week. He passed away in 2006. I’d mentioned in my bio that my dad had me prepare dinner when I was 14. I often wish I had more opportunities to cook for him, especially knowing what I know now. I miss him so much. I plan on sharing a pizza recipe that was inspired my dad’s love for pizza and other flavors that I know he loved. I’ll share a bit more about him later. I know that this is a food blog, but I feel it’s necessary to share what influences my cooking. Yoga has had a major influence on my cooking style. In late 2012 Ned and I began our yoga practice. Little by little I learned more about the practice and it has strengthened me physically. Recently, I’m finding that it is having a positive impact on my mental state as well. Yoga is really powerful stuff! Our yoga studio, Yoga Solar, is just around the corner from our apartment. I would recommend it to anyone in Berlin looking for a yoga studio. Our instructor is incredible and our practice, more specifically known as Hatha, focuses on physical and mental strength building through exercises, poses and meditation. Last week we had very impactful meditation. The theme of the meditation was on mindfulness. Something that up until that point, I can’t say I’ve done enough of. My autopilot response has been to avoid emotional discomfort and sometimes I’ve even found it difficult to be present with feelings of happiness, usually I resort to more familiar feelings like fear and worry. After the meditation, I have approached my week with more mindfulness – being more aware of my surroundings and present with experiences, whether it was painting, cooking or walking through the park. I’ve had a pretty awesome week. Through Facebook, I announced my blog – something I’ve wanted to do for a long time. It was exciting, mostly because I felt the love and support of friends and family who shared, liked and cheered me along with comments. One of the coolest things was receiving responses and encouragement from friends of friends. That was awesome. However, the week wasn’t without its upsets. Through Facebook I was saddened to hear of a friend who lost her grandmother. Although I don’t know this friend very well, with what little I do know of her, I found that she was true to form – eloquent and graceful with her words. She shared a beautiful post that celebrated her grandmother’s life. A very close friend of ours, who we consider family, told us of the unfortunate news that her mother may only have weeks to live. Our hearts are broken for her and all I want to do right now is hug my friend, her sister and her mother with all my might. Also on Facebook, a family member on my mother’s side of the family (Dhenki, my cousin) tagged me in this picture. 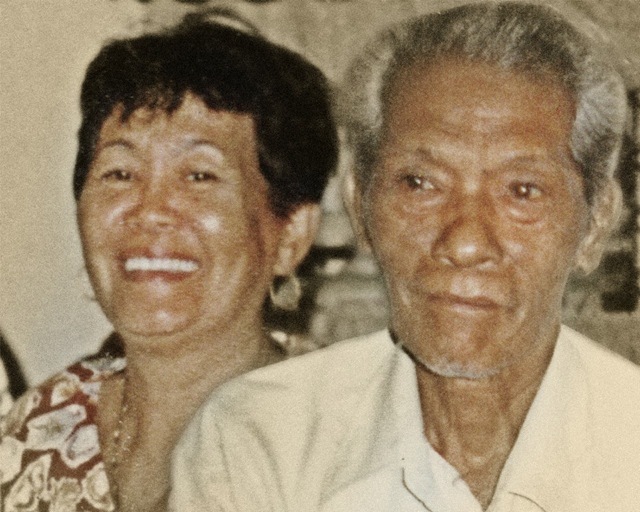 The picture is of my grandmother and grandfather in the Philippines. Sadly, they’ve passed away. Unlike my dad’s side of the family, I don’t know too much about the people who make up my mother’s family. I don’t have memories of playing with cousins from my mother’s family like I do of my cousin, Nadia, my dad’s niece. We played “school” in her big walk-in closet, caught grasshoppers in the summer, and collected crayfish that emerged from their ditches along the quiet street we lived on in Baton Rouge, Louisiana. I don’t have similar stories with the cousins on my mother’s side of the family, though I wish I did. Seeing this picture for the first time stirred up a mélange of feelings and emotions that I couldn’t explain at the time. In the past, when experiences like this occurred I had a tendency to hide, shy away and dismiss my feelings, but this time was different. I remembered what I’d learned during my yoga-meditation and allowed myself to experience all the feelings associated with seeing this picture. It felt as if I was seeing a picture of my Lola & Lolo (grandma and grandpa in Tagalog) for the first time, and in many ways I was. I would now I describe those feelings as feelings of sadness and happiness, connection and disconnection as well as comfort and discomfort all at the same time. Now when I see this picture, my heart is flooded with love and admiration. In the last few days I have had more contact with my mother’s family than I have had in years. I messaged with many of my cousins. My cousin, Dhenki, created a Facebook family page, where family members share pictures and memories of our Lola & Lolo as well as their own families and children. I am overjoyed when I see all of their photos and read their comments. Though I don’t understand most of the comments because they are in Tagalog, I still feel the love – and that feels awesome! I’m glad I allowed myself the time and space to explore those feelings. Because of it I feel I am now able to move towards building closer and more meaningful relationships with the my mother’s family – something that up until now I subconsciously shied way from in fear of rejection and shame. Now there is very little distinction between my “mother’s” and “father’s” families – it’s just my family. Many years ago my dad spent some time with my Lola & Lolo. He had taken a vacation there, alone. My mother was pregnant with my brother, Derek, and couldn’t travel. And when the opportunity to visit the Philippines, following a business trip to a neighboring country, presented itself, he took it. At the time I think I was only seven or eight years old. And looking back I wished I was more mindful and asked him about his experience with them. I’m glad they had that time together. Now, I am even more curious and want to know about his time in the Philippines. I want to know what he thought of my Lola & Lolo and what they thought of him. I’m certain it was nothing but love all the way around! As I close out my first week of blogging I am most grateful for that meditation on mindfulness. It’s heightened my awareness to the world around me, made me more mindful of my current experiences and an overall better person for my awesome friends and family. I’m looking forward to exploring how continued mindfulness meditation will impact my life, especially with regard to my relationships with myself and others. I am also looking forward to how it will impact my cooking. Maybe I’ll learn some really awesome Filipino dishes from one of my many beautiful cousins. Maybe I’ll revise the recipe which was inspired by my dad’s love for pizza, the first and only dish I’d cooked for him. I’m not sure. All I know is right now, at this very moment, it feels like it’s going to be amazing! Phil, you are truly amazing. I am so proud of you and all of your growth that it brings me to tears. Even in its infancy, your blog is fantastic! It’s woven through with your personality, excitement and all the things that makes cooking and sharing a meal with you so great. Even though we’re thousands of miles apart physically, reading about your experiences and how you translate those into your dishes makes me feel like you’re right here with me and I love that feeling. It’s been so great to hear my friends’ excitement over your recipes and hearing them talk about what they want to cook first! Thank you for opening up and sharing this part of yourself. I love you Kuya Phil! It is truly an interesting blog!…. It seem that you never forget to look back in your own culture and that is to be “proudly filipino”. Your blog also tackle about life and inspiration , It is truly amazing on how you express your transparency in life…. always remember “DO YOUR BEST, AND GOD WILL DO THE REST”…. We love’ you kuya PHIL SO TOUCHING it bring me tears…. Very sweet writing about Mindfulness! that are coherent, fluid and related to one another. I am touch by what you have talked about cause I know full well the family of your Mom. I read your blog over and over and your biography too. I will always visit your web site and follow your post on Facebook.